When you accidentally back into your garage door, you're bound to have a million different things run through your head. Maybe you could blame it on your 16-year-old son. The age and inexperience will make the lie believable enough... Then until you realize that you don't have a 16 year old son. You're going to have to get the blame for this one. You just need to man up and face this problem head on. First and foremost, calm down, and hope that it is your overhead door that you heard getting warped out of shape and not your car. Getting repairs done on your car is likely going to cost you more. Once you confirm that it is the door that got damaged, it's time to call our emergency response team. The extent of the damage is also going to be a big factor as to what type of service you're going to ask for. If your door is a single panel door, then chances are the damage is going to be a lot more expensive than if your door is comprised of several metallic panels that are sectioned off by hinges. You need to look into getting a garage door replacement if you or the company determines that repairs will be more trouble than they're worth. If only a few panels have gotten damaged, or only some of the garage door's exterior parts, then you won't have trouble getting them replaced or fixed – especially if they're just bent out of shape or if they just got dislodged from where they're supposed to be. After a successful repair job is finished, you'll be happy to find that the overall design of your home has been saved and that your curb appeal is as good as new – or even better, especially if you opted to get a few upgrades. Next time, however, before you start your engines or before backing up, check your brakes, check your gear and definitely check to see if your garage door clicker or transmitter is working. 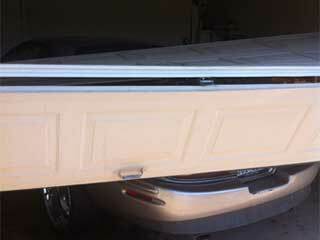 Contact our experts at Garage Door Repair San Diego for fast emergency services. Our quick-response garage door repair team can offer you fast, friendly, and professional garage door services at low and affordable prices. When you need a replacement door that fits your home's décor perfectly, we will offer you the widest selection in town by famous manufacturers at low, competitive prices. Contact our team today and join our long list of happy, satisfied customers. Thank you for choosing our company! Feel free to browse our website for more information in the meantime. Our team at Garage Door Repair San Diego is at your service any time!